With regard to the foundation of the Institute, we have first of all to note the huge contribution of one of the creators of the Bulgarian high technical education – Academician Angel Balevski. In 1945 he was assigned to organize a Chair of Mechanical Technology and Industrial Organization, transformed later into chair of “Metal Science and Technology of Metals”. More than 40 years Academician Balevski was its head. Just of this chair which was affiliated to the then Machine and Electro-technical Institute (later High Machine and Electro-technical Institute and nowadays Technical University) gradually arise individual chairs – “Textile engineering”, “Organization and Economics of Machine Building Production”, “Technology of Machine Building and Metal Cutting Machines”, “Automation of the discrete production”. 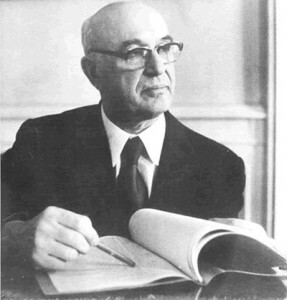 The nomination of Academician Balevski for the head of the Institute is not by chance – all the time as a Chairman of the BAS, he was establishing and developing together with his collaborators a very important branch of the engineering science in Bulgaria – metal science and technology of metals. One of the greatest achievements in that field is the worked out by Academician Angel Balevski and Corresponding Member Ivan Dimov “Gas counter pressure casting method”, which is a scientific and technological novelty in the worldwide art for production of light alloy castings of high accuracy and high mechanical and technological characteristics. It also provides new conditions for treatment of the molten metals by gases and paved the way for the production of new alloys. In memory of the great Bulgarian scientist, social figure and university lecturer, the Scientific and Technical Society of Machine Building at the Federation of the Scientific and Technical Societies founded a prize in his name. It is awarded to Bulgarian scientists mechanical engineers that had shown in the last eight years great achievements in the field of the fundamental theoretical and/or R&D investigations as well as in the development and implementation of new efficient engineering solutions. Foundation “Eureka” also founded a grant for engineering sciences in the field of machine building technologies in the name of Academician Angel Balevski.